Krasno se je bilo pozabavati z novo štampiljko, ki sem jo kot gostujoči oblikovalec pri Bunny Zoe's dobila od Nikki. Štampiljka Marianne Design je kot nalašč za njihov nov izziv . Tema je namreč poletni čas. Cvetoči travnik, poln živopisnih metuljev, nudi prelep pogled vsem ljubiteljem narave. Zato sem se odločila, da na sprehod po cvetočih poljanah popeljem Marcy. - veliko rožo z listi in perle iz domače zaloge. Through the craftroom door: Anything goes 7.-13.7. Beautiful creation! Awesome coloring job! Thanks for joining us this week at Loves Rubberstamps! This is gorgeous, such a beautiful image and lovely rich colours - a fabulous card. Such a lovely card with the vibrant colors and flowers. It is perfect for the latest color challenge at YNS. Thanks for joining in the fun and sharing your take! So beautiful! Gorgeous image and details! Hudo fina gospodična v lepih barvah:), LP Andreja V.
Lovely card, wonderful image and the flowers are so pretty. Thanks for entering our challenge at Lil Patch of Crafty Friends! Beautiful design with so many great summer elements. Everything looks pretty with the colour inspiration from the Your Next Stamp challenge. Thanks for sharing and playing along with our YNS challenge. 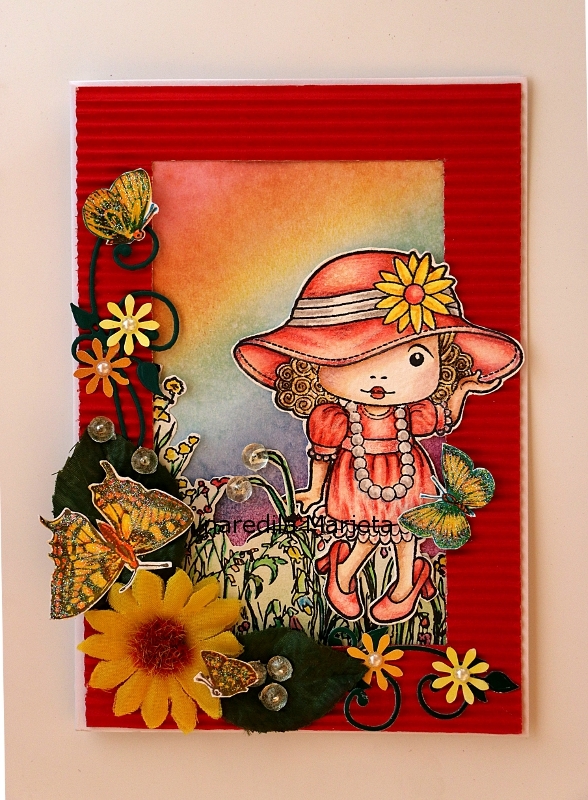 Love the way you combined the stamps to make a flowery, summer card. Such wonderfully bright colors too. Great use of the challenge colors.. Your coloring is beautiful! Thanks for joining us at YNS! such a sweet card and great colors! Beautiful card! Love that background too, Thanks for joining us the Paper Nest Dolls Challenge Blog, good luck! Beautiful card and coloring! Wonderful take on the challenge colors. Thanks for joining us at YNS! LOVE this! Thanks for leaving a comment on one of my ATC'S on my ATC blog!